Short runs of labels, decals, control panels, and other durable markings. Print only what you need exactly when you need it. You can design, print and cut decals quickly and efficiently -- no matter how many or few you require. 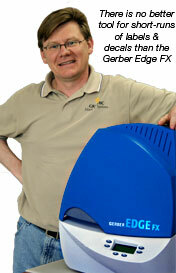 The no-mess beauty of the Gerber Edge FX thermal printing system gives you the flexibility to print everything from Lexan control panels to industrial decals with variable data. No fumes, no cleanup--just print, cut, and go! And you can cut out the most intricate shapes -- no more paying for expensive dies. Our four components (Omega design software, Gerber Edge FX printer, Laminators, and plotters) produce a wide variety of durable markings such as labels, decals, data plates and control panels.